Today we had the pleasure of welcoming two of the representative from Tenovus to Chepstow Plant Services in Newport. To formerly accept the funds raised in the Dudes, Diggers and Mountains 3 Peaks Challenge that took place in July. 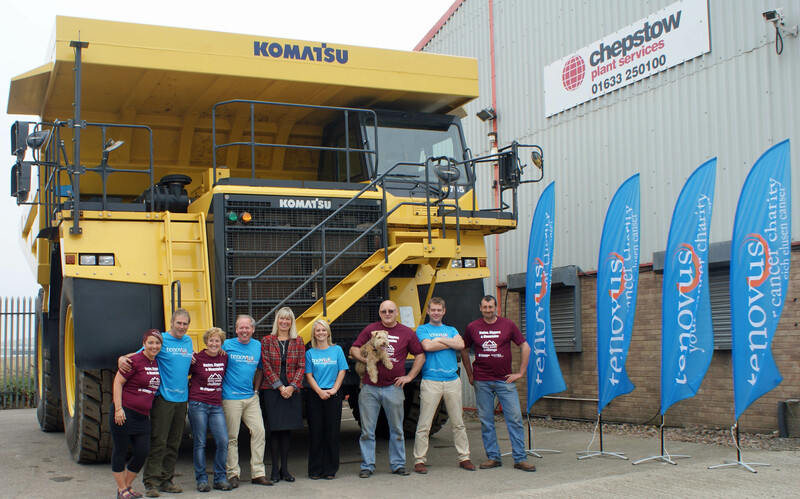 Claudia McVie, Tenovus Chief Executive and Bethan Palfrey, Challenge Event Fundraiser joined us for some photographs with one of our super big mining trucks, a Komatsu HD785-7. Neither could believe the size of the truck and were very eager to get behind the wheel for a photograph opportunity – although we couldn’t hand them the keys! The final total of the efforts made by all on the 5th July was over twenty five thousand pounds - £25,898 to be precise! It was such good fun and a great way to raise money, Jon Williams Managing Director of Chepstow Plant Services is already planning the next event, we are all very afraid! !